Orson Welles invented a genre, and died before anyone found out. 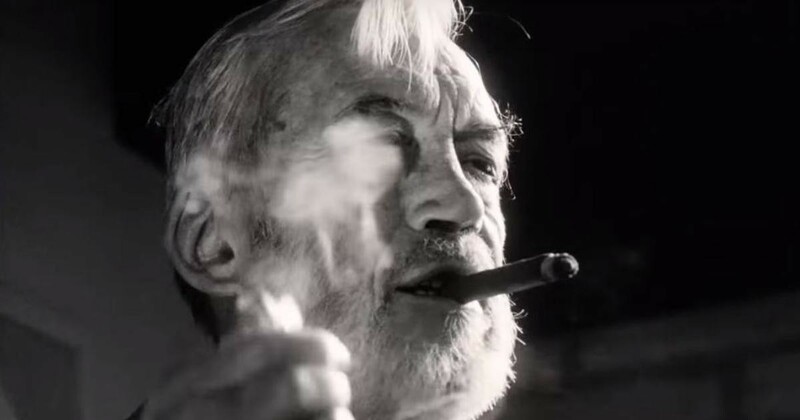 Had it been released, as intended, in the 1970s, Orson Welles’ The Other Side of the Wind would have completely redefined the found footage genre. Well, “redefined” isn’t the right word. After all, found footage cinema didn’t exist during the film’s production. Welles was inventing it. So had it been released back then, it’s more accurate to say that The Other Side of the Wind would have defined the found footage genre in a way entirely different to our current understanding of it. The concept of fiction which takes the form of a “real life” collection of documents is much older than film itself. Epistolary novels told their stories as a collection of letters between characters. Welles himself translated this idea to radio with his infamous War of the Worlds broadcast, which was written and acted as though it were a real news broadcast. Found footage has been with us for a very long time, but Welles would have been the first to bring the concept to the cinema. As history stands, though, the most widely cited originator of found footage is the 1980 horror film Cannibal Holocaust. It set down the genre’s rules and structure, a format that would popularly codified with 1999’s The Blair Witch Project. Though there were examples in between (Man Bites Dog being perhaps the best-known entry in the genre during this time) it’s safe to call these two film the mothers of found footage film. The guidelines they created were rarely deviated from by their imitators. For one thing, most found footage films that followed in their wake were also horror films. Blair Witch proved the possibility for terror which a locked perspective could inspire, and the success of Paranormal Activity nearly a decade later proved to studios the utility of the genre’s cheap-and-easy production model. Found footage became irrevocably associated with horror, such that painfully few filmmakers ever experimented with the form outside of that genre. Another important aspect of found footage is that, obviously, the footage must be found. The use of the form implies a terrible fate for the people at the film’s center, usually spelled out in a Shakespearean prologue before we even see them. The finder of the footage is rarely relevant. They are typically unseen and unheard from, acting as invisible editors. Sometimes, as in Blair Witch Project, the implication is that the credited crew themselves are behind the assemblage of the footage. Most of the time, however, it’s simply a question left unanswered. We aren’t supposed to care about the person who found the footage and presented it to us. The motives behind their choice to present the film the way they have is, we’re told, irrelevant. But what if the genre’s forefather had not been Cannibal Holocaust, but The Other Side of the Wind instead? It’s not a horror film, for one thing. Had it been released in the 70s, the entire concept of found footage would have been borne out of a drama with comedic elements. Would this have convinced filmmakers that the form was more elastic than it is commonly considered today? I think it would have. I also think found footage would be respected as the bold cinema experiment it is, rather than the cheap throwaway production style it’s so often perceived as today. Coming from Welles, it would have been appreciated as a brash step forward for the medium, if not in its time, then at least down the road. But this isn’t the history we’re living. The Other Side of the Wind was released in 2018, following decades of other found footage releases. So let’s look at it in that context, in how it breaks some rules and follows others, and how it still manages to redefine the form. The genre significance here isn’t clear until the film is over. Here we have a found footage film whose perspective is driven not by the footage’s shooter, but by its editor. There is no one point of view through which we see Hannaford, but dozens of them, and they are only made somewhat coherent by Otterlake decades later. The film’s perspective is created in editing, and it’s still disparate and schizophrenic due to the sheer number of people filming. Everyone at the party sees Hannaford differently, and it takes Otterlake decades in the film’s narrative to put aside his own feelings about how he comes off in the footage and put together a representation of Hannaford. It’s impossible not to see the film as both tribute and repudiation of Hannaford by Otterlake, whose conflicted feelings toward his mentor are clear even at the time the footage was shot. It’s easy to see the allure of this concept for Welles. He was a filmmaker who was more fascinated by the power of editing than of the camera itself. Early in the film, a film student interviewer asks Hannaford, “Is the camera a reflection of reality, or is reality a reflection of the camera eye? Or is the camera merely a phallus?” Hannaford answers: “I need a drink.” It’s clear that Welles found this approach to cinema, at best, a silly waste of time, and at worst a grating misunderstanding of the medium he so loved. His final real feature, F for Fake, is consumed with the mysterious power of film editing, and he would have iterated on that in The Other Side of the Wind. Welles seemed to want to experiment with this massive jumble of perspectives, to see if he could find something singular through their combination, or else to disorient and befuddle by the same token. For him, found footage was less about a collection of images which imitated reality and more about what could be found through the coherence or incoherence of those images. What if he could find a throughline in them, and what would it mean if he couldn’t? An odd aspect of the film is how cameras are both universal and absent, visible and invisible. Oftentimes Welles employs a shot-reverse setup which does not show the camera that ostensibly is shooting one or both angles. At other times, though, cameras are everywhere, crowding the image, intrusive and domineering. Welles doesn’t insist upon the found footage angle in the former moments. Rather, he suggests that even if we can’t literally see every camera, these people are constantly being surveilled in ways even they cannot see. The camera is ever-present in The Other Side of the Wind, even when we don’t see it. In the latter moments, though, cameras are unavoidable. If the camera really is a phallus, you could call Hannaford’s birthday a sausage party. His house is filled with an amorphous panopticon, oozing through every hall like The Blob, intent on absorbing Hannaford. It’s interesting that, in the end, it doesn’t. The planned ending of the film would have had Hannaford kill himself by crashing his car through the screen of the drive-in where his film was playing. It’s a playfully provocative image, and it would have implied a final surrender to the onslaught of cameras, a last desperate act captured for eternity. The finished film doesn’t contain this shot, however. It was never filmed by Welles before his death. Presumably Bogdanovich and his collaborators either were reluctant to shoot new footage or found it too difficult to create the shot without the also-late John Huston. Whatever the case may be, the absence of footage of Hannaford’s death in the final film could be seen as the man escaping from the oppressive pressure of all those viewfinders, rather than succumbing to their power in a public display. This is so antithetical to how we think of found footage that it’s kind of astonishing. An important aspect of the “bad ending” so many found footage films have is that we have to see it on camera. At the very least, as in The Blair Witch Project, we have to see the moment just before it happens. We get no such satisfaction in The Other Side of the Wind. This positions The Other Side of the Wind as an anti-found footage film of sorts, but also as the most honest expression of what the form really means. Found footage purports to capture the truth of its subjects, with realism and a constantly open eye. But so often in these films we see people performing for the camera, putting on a persona that exists only because they know they are being filmed. The camera, which is supposed to capture truth, creates lies by its very nature. Welles saw in the medium what few other found footage films have ever comprehended. He understood how the presence of the camera generates falsehood in its subjects, and that if such a thing exists as actual truth, it cannot exist on film. The panopticon tried its best to capture Hannaford, but it could only see him as he performed, not as he was. The only truth we know about him is that he chose to die, and no camera sees that moment of choice. Even in Welles’ planned ending, we would only have seen the aftermath of that decision. It’s hard to imagine where found footage would be if The Other Side of the Wind had come out on schedule. It’s possible that it wouldn’t have altered the genre’s history at all, or that it wouldn’t have been considered part of the same lineage as Cannibal Holocaust or The Blair Witch Project. Maybe found footage wouldn’t be considered a genre at all, as its genesis would be untethered from horror. Maybe the found footage landscape would be completely different. But it does little good to speculate. The Other Side of the Wind is a 2018 film. It is here, it is now. It exists in the context of decades of found footage work, despite having been shot before all of them. It makes me wonder what Welles would think of all those films. Would he see the value in their use of the medium he surreptitiously invented? I can say only this with confidence: I bet he’d be glad that people know he got there first. I write about movies, TV, games, and sometimes other stuff.